We’re talking with Barbara Close of Naturopathica about aromatherapy and how to effectively use it in your spa and treatments. We asked Close about how to create an effective aromatherapy experience in your spa (read that here). And we also asked her to tell us about some of her favorite essential oils and what they’re used for. We also asked about what the best oils for anxiety are, and what scent she thinks is underrated. Balsam Fir – The balsamic and woody aroma of this oil works as an antidepressant, delivering uplifting qualities and working as a decongestant to stimulate circulation. Blue Eucalyptus – This oil features a cool and clarifying aroma. Prized for its antiseptic qualities, it can help ease colds, congestion, and muscle stiffness. Peppermint – This oil’s sweet aroma has detoxifying properties, providing lymphatic stimulation and acting as an antidepressant to refresh fatigued minds. Pink Grapefruit – This oil’s sweet aroma has detoxifying properties, providing lymphatic stimulation and acting as an antidepressant to refresh fatigued minds. Bergamot – Typically grown on the southern coast of Italy, this oil’s bright, citrus aroma helps ease stress, anxiety, and nervous tension. Use caution when using bergamot topically as it can increase skin sensitivity and create hyperpigmentation. Lavender – Recognized for its fresh, rich, herbal aroma, the high Linolol content in Lavender essential oil helps to balance the emotions and serves as a powerful antidepressant, promoting relaxation and sleep. Roman Chamomile – A fresh, sweet, apple-like aroma soothes nervous tension, acting as an antidote for stress and anxiety. Rose – Citronellal and geraniol give this oil its soothing and balancing properties. Excellent for calming down irritated skin, as well as for relaxing the central nervous system. St. John’s Wort – St. John’s Wort may help to promote self-confidence and increase mental clarity, and is believed to have mild euphoriant properties for helping with seasonal affective disorder. Some of my favorite combinations are featured in the Naturopathica Aromatic Alchemies, which combine 3-4 proven essential oils in a base of Jojoba Oil, so they’re safe to apply topically to the skin. Chill Aromatic Alchemy: Chamomile is blended with Lemon Verbena and Neroli Blossoms and then delicately layered with Bee Balm to calm anxious thoughts, soothe frayed nerves or promote rest and relaxation. Inspire Aromatic Alchemy: This intoxicating melange of rich Balsam Fir Needles, juicy Pink Grapefruit, Red Mandarin and mood-balancing St. John’s Wort encourages self-confidence and grounds the emotions. Meditation Aromatic Alchemy: Ancient sacred oils of Sandalwood and Frankincense are blended with grounding essences of Ginger Root, Clove, Cardamom and Sweet Orange for clarity with daily meditation. Re-Boot Aromatic Alchemy: Lemongrass and Peppermint energize the senses while Holy Basil, a staple of Ayurvedic medicine, is used to help increase the body’s resistance to stress. 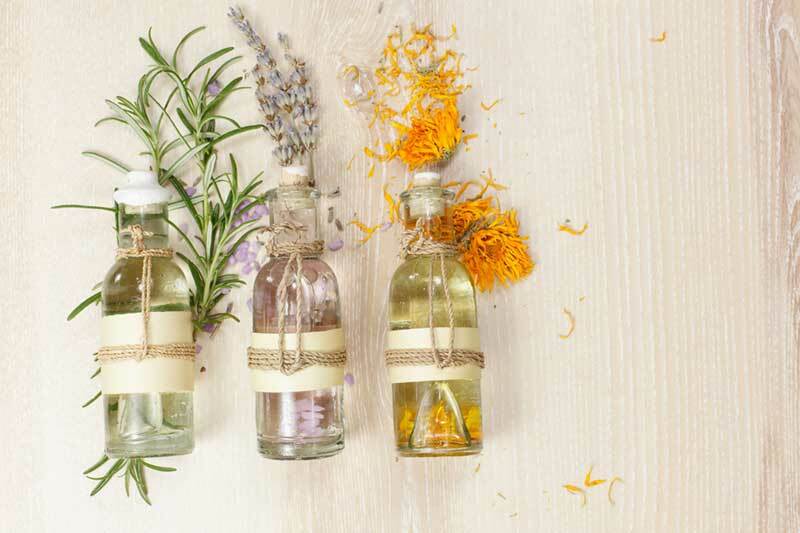 If you’re blending essential oils for use in a spa, the basic rule is to combine no more than a total of four or five essential oils in a blend. An ideal amount is usually three or four oils; with more than four, the blend begins to get crowded and loses its effectiveness. Essential Oils should always be diluted in a carrier oil like Jojoba Oil, Apricot Kernel Oil, Almond Oil or Sunflower Oil before applied topically to the skin. The carrier oil should be selected based on where and how the oil is meant to be used. One of my favorite Essential Oils is Vetiver, a root with a rich, exotic aroma, similar to Sandalwood. It’s used in aromatherapy for grounding the emotions and easing stress.